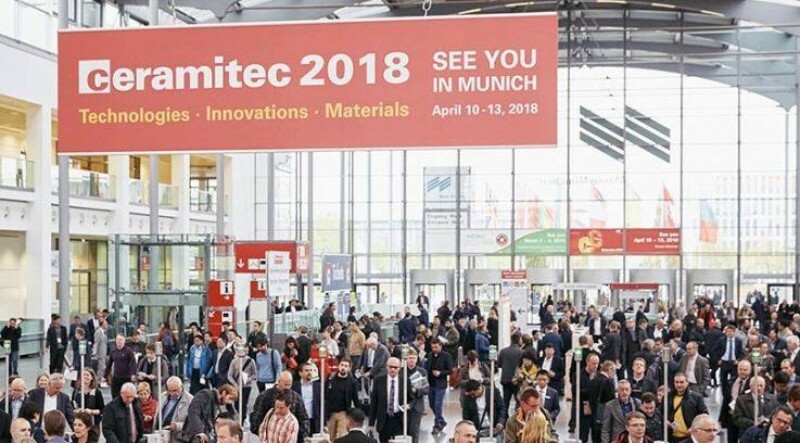 In the run-up to ceramitec, the international key trade show of the ceramics industry (in Munich from April 10 to 13), the mood in the industry is overwhelmingly positive. This is illustrated by the results of the ceramitec industry barometer* for which more than 600 representatives – predominantly decision-makers – of German and international companies were surveyed on their investment behavior and on what is currently happening in the industry. According to this survey, 96 percent of the companies worldwide are planning to increase their total investments in the coming year (44 percent) or to keep them at a high level (52 percent). “The traditional ceramics and powder metallurgy industry is getting into shape for the digital era and in doing so, it shows innovative spirit. At a global level, 59 percent of the companies rate their commitment for research and development as good or excellent. In Germany, this is the case for even more than three quarters of the companies. That is one of the findings of our industry barometer, a survey conducted by a market research institute commissioned by the ceramitec trade show”, says Gerhard Gerritzen, Member of the Board of Management of Messe München. Accordingly, 47 percent of the companies worldwide intend to increase their expendi-tures for research and development and 51 percent plan to hold their expenditures in this field constant. The industry is similarly eager to invest with respect to its production and manufacturing: 44 percent of the German companies and even more than half (54 percent) of the companies worldwide are planning to spend more money for new machines, infrastructure, procedures etc. in the year to come. ceramitec serves the industry’s future-oriented attitude. “Ceramics are materials with a history stretching back thousands of years and with a bright future. The application possibilities are becoming ever greater, ranging from the deep sea to cars or the smartphone through to aerospace. New procedures like additive manufacturing contribute to this development. At ceramitec, we will offer comprehensive information on the new possibilities and application fields by means of the newly created ‘Additive Manufacturing” special area, among other things,” comments Gerhard Gerritzen, Member of the Board of Management of Messe München. On a global scale, the increasing automation of production carries the most weight for decision-makers holding sway over investment projects (35 percent). It is followed by new raw materials and additives, powder, production materials and auxiliaries (25 per-cent), and the topic of energy efficiency (13 percent). The gradual automation of production is accelerated by digitization. In this respect, the major part of the industry considers itself to be on the right track: more than 60 percent of the companies surveyed on a global scale are either pursuing an explicit digitization strategy, have already digitized important processes or even consider themselves as pioneers in this field. Overall, the industry sees digitization primarily as an opportunity – particularly in order to increase the quality of their products and services (41 percent), to reduce costs (38 percent) and above all to raise customer satisfaction (34 percent) or to be able to respond more flexibly to customer requests (36 percent). Simultaneously, however, approximately one third of the companies see the high investment costs connected with digitization as a barrier; moreover, the adaptation to existing IT systems (24 percent) and the shortage of in-house competency (19 percent) frequently cause difficulties. In addition, companies have to face further entrepreneurial challenges: on a global scale, a large part (37 percent) of the ceramics and powder metallurgy industry sees itself exposed to high competitive and price pressure. Accordingly, the tapping of new (sales/production) markets currently ranks among the most pressing tasks for many companies (39 percent). A further issue is the fact that in Germany, in particular, the ceramics sector is faced with a severe shortage of skilled professionals. Nearly half (44 percent) of the companies has difficulties in finding a sufficient number of suitably qualified personnel. In other regions, the situation is at least somewhat less strained. Actually, only 24 percent of the respondents in the rest of Europe and only 21 percent of the respondents in Asia rated the shortage of skilled professionals as one of the biggest problems. ceramitec will deal with this topic within the framework of the CareerDay on April 13, and will bring together students and young professionals with attractive employers on this information day. The event takes place on April 10 to 13 on the exhibition grounds of Messe München.